"With so much emphasis on The Queen's Diamond Jubilee this year, we felt that it was important to celebrate this milestone birthday." 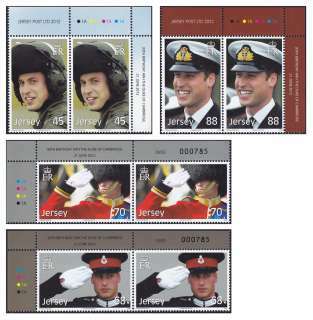 Celebrating the 30th birthday of HRH The Duke of Cambridge on 21st June 2012 with a set of four stamps which reflect his military connections and achievements. As second in line to the British Throne, The Duke of Cambridge will, one day, become Head of the British Armed Forces. Recently serving as a fully operational RAF Search and Rescue Pilot, The Duke still holds his officer commissions in the Royal Navy and the Army. He also holds various honorary titles which have been bestowed upon him by HM The Queen. Pictures on the stamps show the prince wearing British Army, Royal Air Force, Royal Navy, and Irish Guards uniforms. Prince William joined the Royal Military Academy Sandhurst as an Officer Cader in January 2006 and was commissioned as an Army Officer in the presence of HM The Queen just 11 months later in December 2006. He then joined the Household Cavalry 'Blues and Royals', following the path of his younger brother, Prince Harry, and rose to the rank of Lieutenant. The stamp features Prince William at Prince Harry's Passing Out Parade at Sandhurst in April 2006. From the Blues and Royals, Prince William embarked on an intensive training course at Royal Air Force College Cranwell and received his RAF wings in April 2008 from his father, HRH The Prince of Wales. Flight Lieutenant Wales undertook further helicopter flying and advanced training to graduate from the RAF Search and Rescue Conversion Course. At the time of writing, The Duke is based at RAF Valley in Anglesey, Wales as a pilot with the RAF's Search and Rescue Force (SARF). He was appointed Honorary Air Commander of Royal Air Force Coningsby in October 2008. Prince William spent four months on secondment to the Royal Navy in 2008 and, during that time, was on a one month posting with the Frigate HMS Iron Duke. The ship was patrolling the warmer climes of the Caribbean when Sub-lieutenant Wales took part in a massive drugs capture. HMS Iron Duke was made 'Jersey's warship' in 2010 when she was officially affiliated to the island. She made her first visit to Jersey in November 2011. The Duke of Cambridge has been Commodore in Chief for Scotland and also Commodore in Chief for Submarines since 2006. Prince William was appointed Colonel of the 1st Battalion Irish Guards, his first honorary appointment in the Army, by HM The Queen in February 2011. It is the first time that the position has been held by a member of the Royal Family. When The Duke of Cambridge married Miss Catherine Middleton on 29th April 2011, he chose to wear the striking red Irish Guards Officer's tunic as it was his highest ranking position.